From April 20 – 23, 2018, CPT founder and Head Trainer and Dog Star Technologies Chief Operating Officer Mark Spivak attended the 2018 PennVet Working Dog Conference proximal to the campus of the University of Pennsylvania’s School of Veterinary Medicine. The 4-day conference featured nationally and internationally recognized speakers in the multidisciplinary fields of canine genetics, breeding, scent dog training, service dog training, evaluation, nutrition, fitness, behavior, and veterinary health. 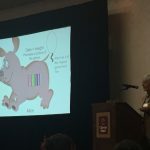 The conference audience consisted of researchers, veterinarians, working and service dog program coordinators, working and service dog trainers, breeders, behaviorists, and PhD students in animal sciences and psychology. Given the quality of the speakers and the audience, the conference provided excellent networking opportunities and information beneficial for productively evolving the evaluation, training, and fitness protocols for CPT’s service dog program. While attending, Mark listened to numerous insightful speakers from the USA, Canada, and Israel and had the opportunity to observe the PennVet Working Dog Center, where they breed, train, sell, and study dogs for military, law enforcement, and disaster search purposes. In addition, he made contacts with operators of the PennVet Working Dog Center, AKC executives involved in funding research, managers in the Department of Agriculture scent dog program, persons involved in designing and marketing leading edge canine fitness equipment, ADI executives involved in lobbying politicians to establish service dog policy, and persons involved in designing and marketing advanced service dog harnesses. Jane Russenberger explains why not all dogs or even purpose-bred dogs are optimal service dog candidates and how a properly designed breeding program can increase the number of high-potential candidates. Jane Russenberger explains how a well-designed breeding and evaluation program improves service dog graduation. Cindy Otto explains the benefits of PennHip vs. the OFA diagnostic method of hip dysplasia and methodologies of hip dysplasia treatment and rehabilitation. Elden Leighton explains the effects of genetics within a well-designed breeding program. Mark Ruefenacht explains methodologies and benefits related to proper statistical measurement of service dog performance. Bridget Stewart explains the stages of a working dog proprioceptive training program. Since returning from Philadelphia, Mark has scheduled a session for CPT’s service dog trainers to update them regarding pertinent information from the Conference. Bridget Stewart demonstrates proprioceptive training at the PennVet Working Dog Center. A PennVet WDC Trainer demonstrates working dog proprioceptive training during a tour of the PennVet Working Dog Center.